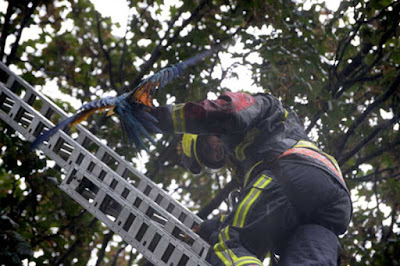 A 13-week-old parrot had a first flight he'll want to forget after getting lost and stuck in a tree. 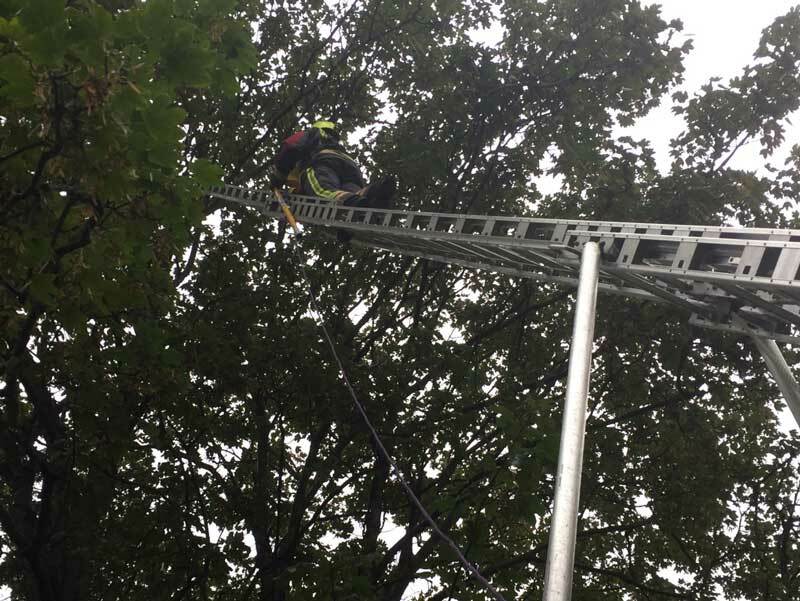 It took ingenuity and improvisation from Red Watch from Newark Fire Station in Nottinghamshire to rescue Bobo who seemed set on resisting their attempts. 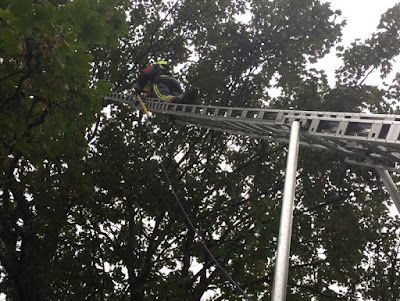 A ladder was extended so firefighter Richard 'Fergie' Ferguson could use a pole to try and tempt Bobo to perch on it so he could be brought safely to ground - and for a while it looked like it would work. However, as the rain began to teem down, Bobo got unnerved, squawked and fluttered agonisingly out of reach. Back on the ground, Fergie and the rest of Red Watch, now joined by the fire station's rescue tender, were hatching a plan. They emptied a rope bag and fixed it to a pole using gaffer tape, cut a hole in it and used a stick to keep the bag rigid. Up went Fergie again, and within minutes Bobo had been encouraged to climb into the bag and Fergie was able to grip him by the legs and bring him down to earth, earning himself several pecks on the hand for his trouble. The drama unfolded when Rowan Cozens decided to cut the lawn of her property in Newark before the rain started in earnest on Friday. "I decided to get up really early and cut the lawn. I was part of the way through it and thought 'that's a parrot I can hear - I didn't have that much wine last night surely," she said. "There he was - in the tree." 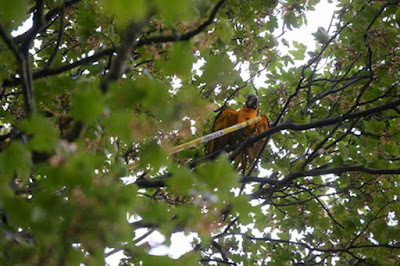 The fire service were summoned and a message reached Bobo's owner Emily Portrey who had advertised the bird as missing on social media. "He's the second parrot but the first macaw I've owned," Emily said. "He only learned to fly the day he went missing. It was his first flight. He's only 13 weeks old. He always stands on my shoulder and I have a harness for him but before I could attach it he took off and just kept on going. "I was so worried as to where he could have got to. He was missing the whole night. He's only a baby." 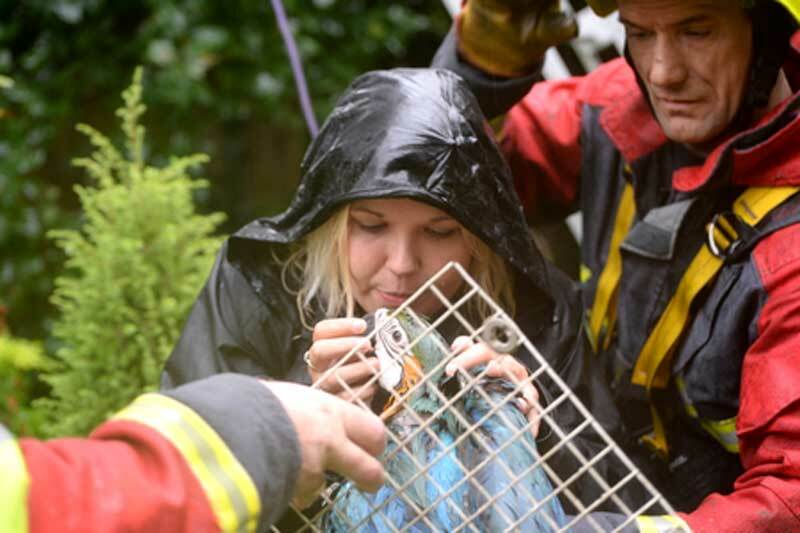 Crew manager John Fox, from Red Watch, said: "This is only my second bird rescue in 27 years' service and it's one for the memoirs. We've used a rope bag for bringing tiles down from a roof before but never for anything like this. It was true improvisation. We're glad it's a happy ending. 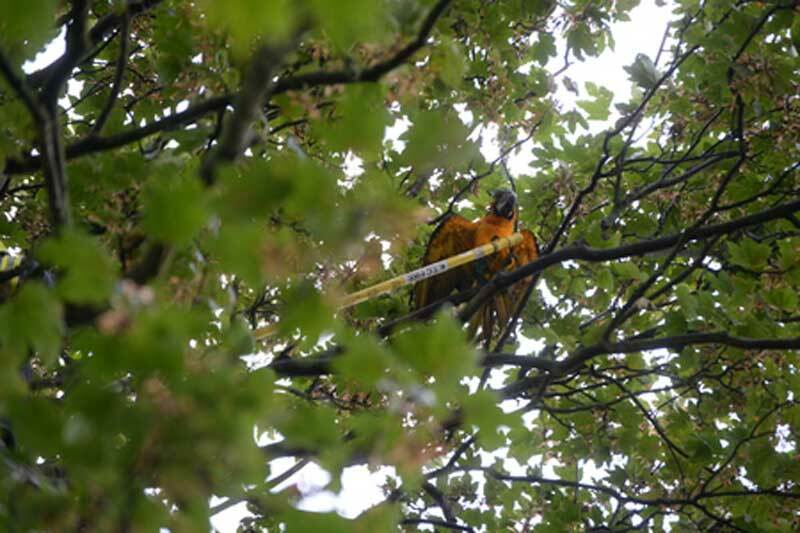 We were a bit worried he'd just hop from branch to branch or, worse, take flight again." Emily added: "I can't thank the fire service enough or Rowan for finding him." I guess we learnt flying upwards; downwards is learnt another day.